Remember, the Android Pay mobile passes creation is a beta feature, so many small features related to it may not be fully available yet. 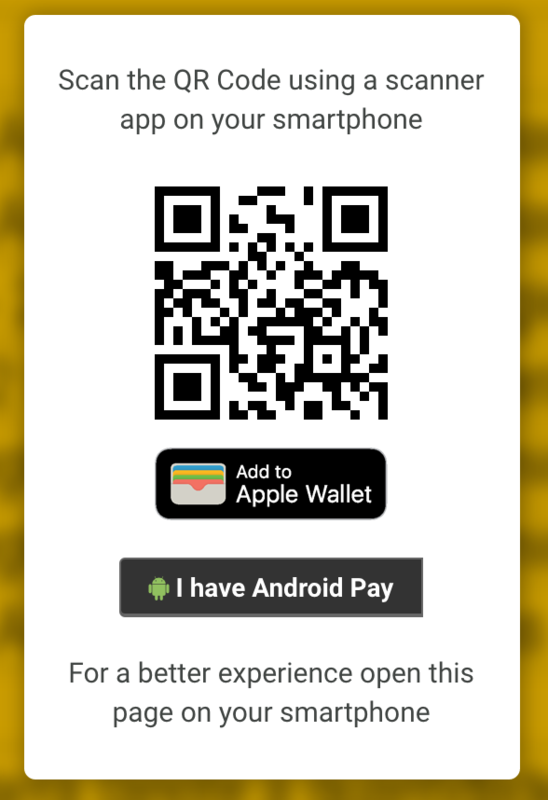 We’re constantly improving the integration with Android Pay, especially the creation flow. So, if you find anything that is not working as expected, please let us know. 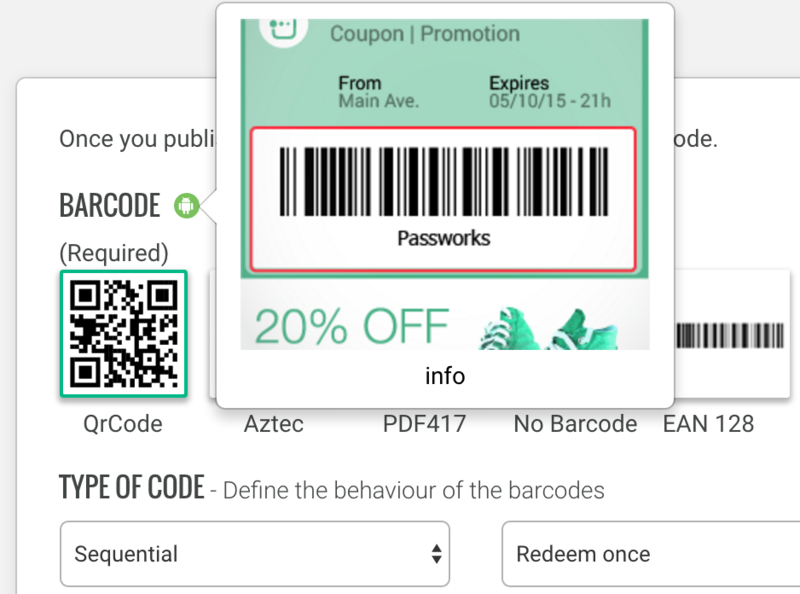 If you arrived here, you’re probably about to create mobile passes targeted to the Android Pay platform. 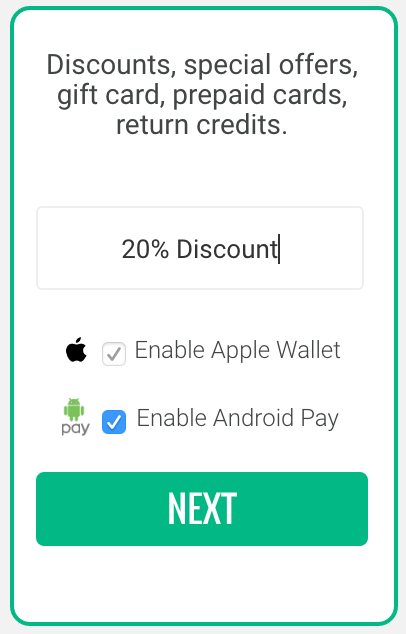 In case you haven’t yet fully understand the concepts, please see our Introduction to Android Pay page and then return to the creation process. 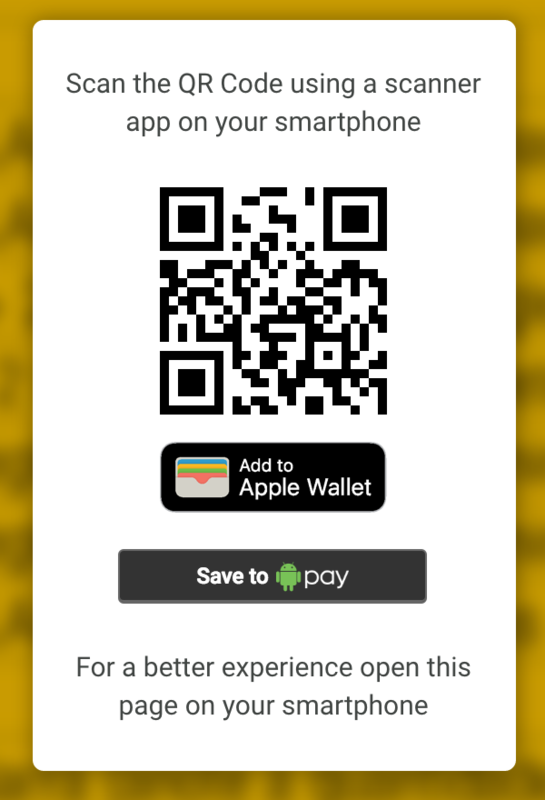 Aiming to give you a fast and practical way to create mobile passes for the Android Pay, we’ve used the current Apple Wallet (formerly Passbook) flow to creating them, as you might know, the passes are not visual maching, however the fields available follow the same structure. Confused with the pass name and types? Check our Pass Types page with the compatibility table. 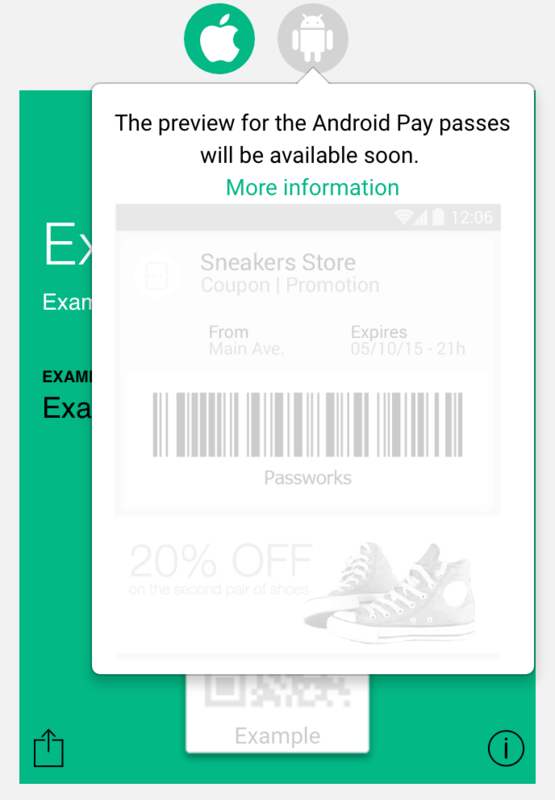 The preview for the creation of a Android Pay template is not available yet, however, our current flow to creating passes uses the preview for interacting and filling the pass template and data. So you should, temporarily, interact with the Apple Preview for creating the fields. Remember: You don’t have to limitate the pass creation by the visual on the preview. It’s expecting a Apple Wallet (formerly Passbook) information (witch differs on field size limitations). So, don’t worry about the look and feel here and focus on the final pass. It is worth reading the Android Pay documentation regarding the pass structure and how all this information is going to be rendered. 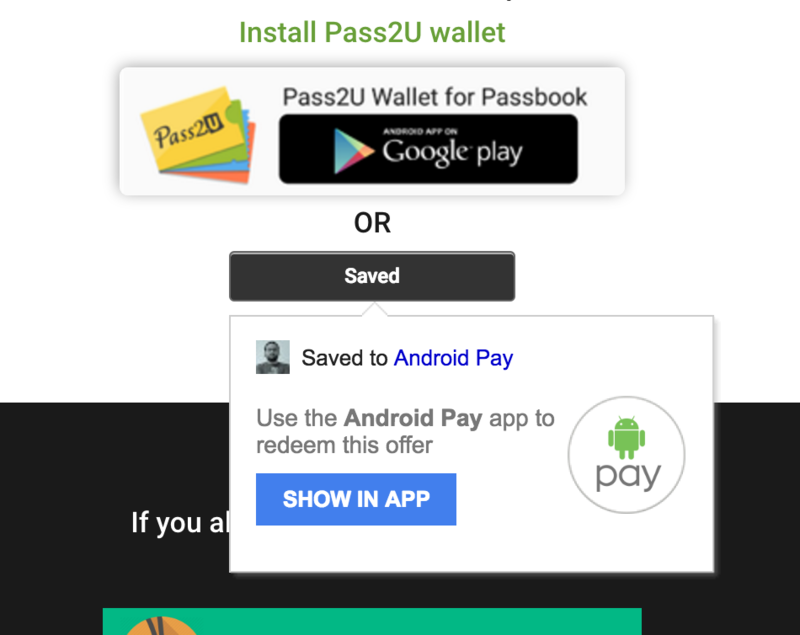 In the first release of Google Wallet, it was possible to choose the pass colors (background and text colors), however it was deprecated since the migration to Android Pay. The pass color rendered at the devices will be retrieved from the Icon image you’ll associate with it. The algoright used try to figure the dominant color out and set it as background color. 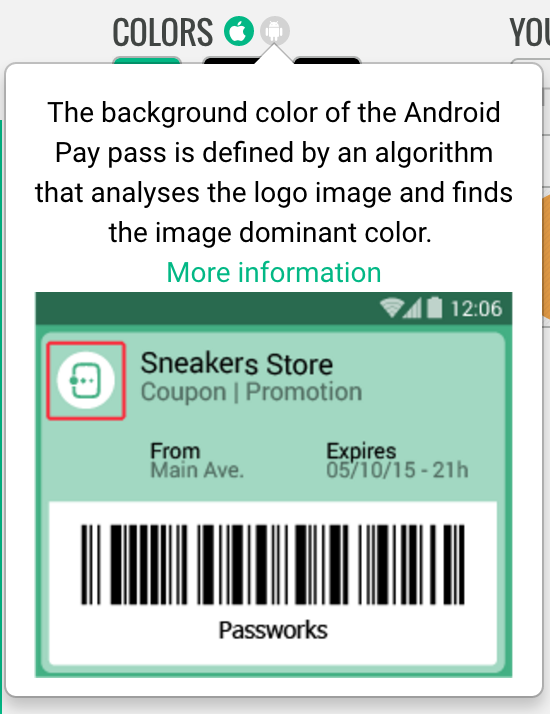 We’ll son release the Android Pay designer template creator with the same algoright associated so as soon as you choose the icon’s image, we’ll check for the right color. 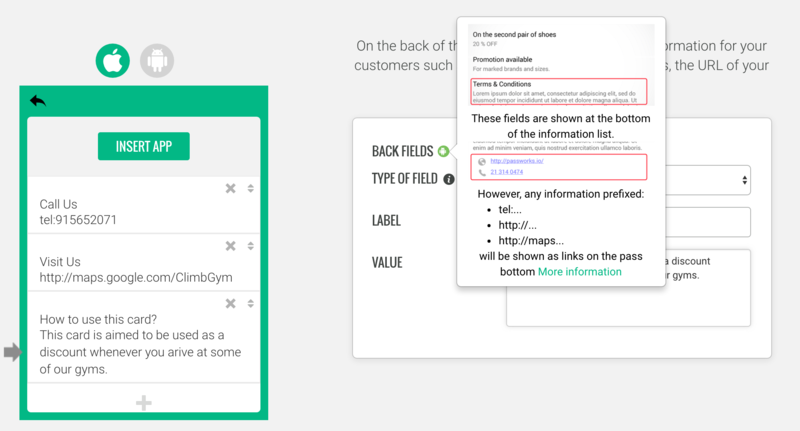 The Notification Title and Logo Text will be used as the pass title, if this information is not defined, the Campaign Name and Organization Name will be used instead. 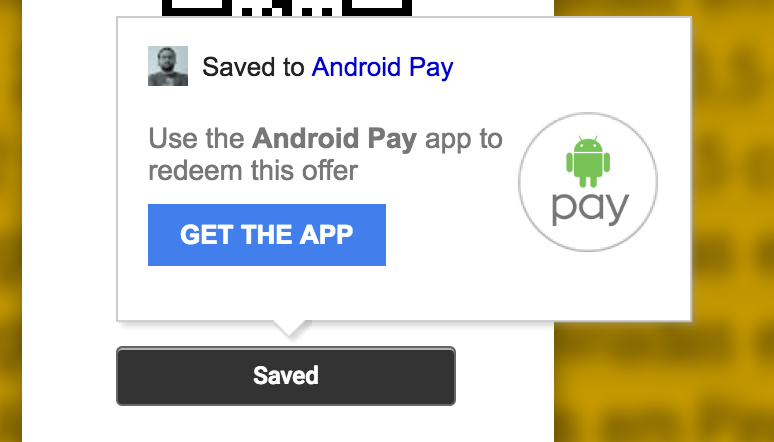 For the Android Pay passes, you can use an Icon and a Strip Image. As mentioned before, the Icon is essencial as the pass color is defined based on this image and, of course, it’s your brand name here. 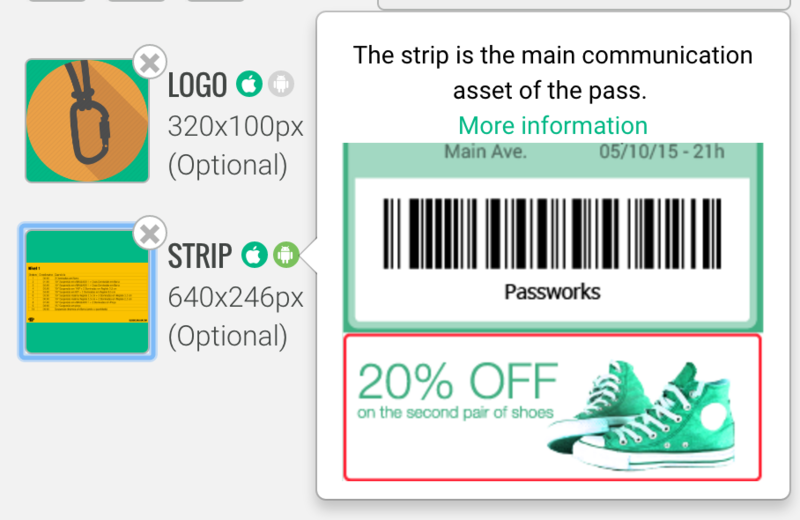 The strip image will be shown as the first item when navigatin to the pass detail. The strip image doesn’t have a constraint ratio defined for its size, so very long images are allowed. Take care while choosing it. Once again, it is worth reading the Android Pay documentation regarding the pass structure and how all this information is going to be rendered. All those fields are basicaly key/value and neither of those have restrictions about the title or description text size. Check our Supported Barcodes page with a complete list and detailed information about each barcode type. 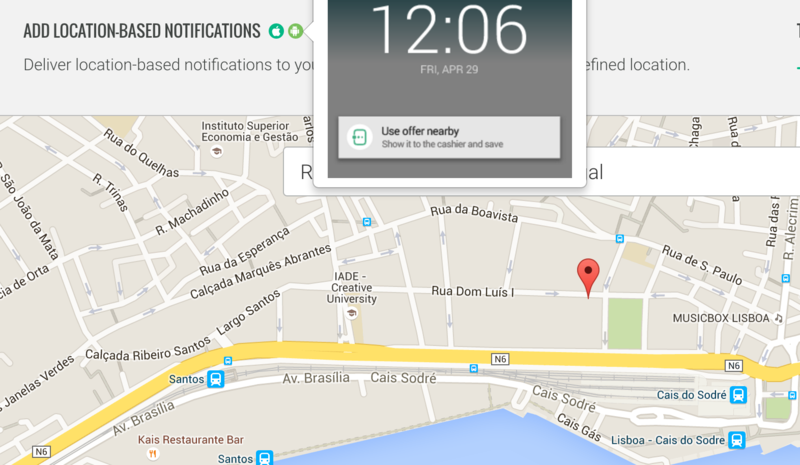 You can define up to 10 locations where a notification is going to pop at the holder’s device. 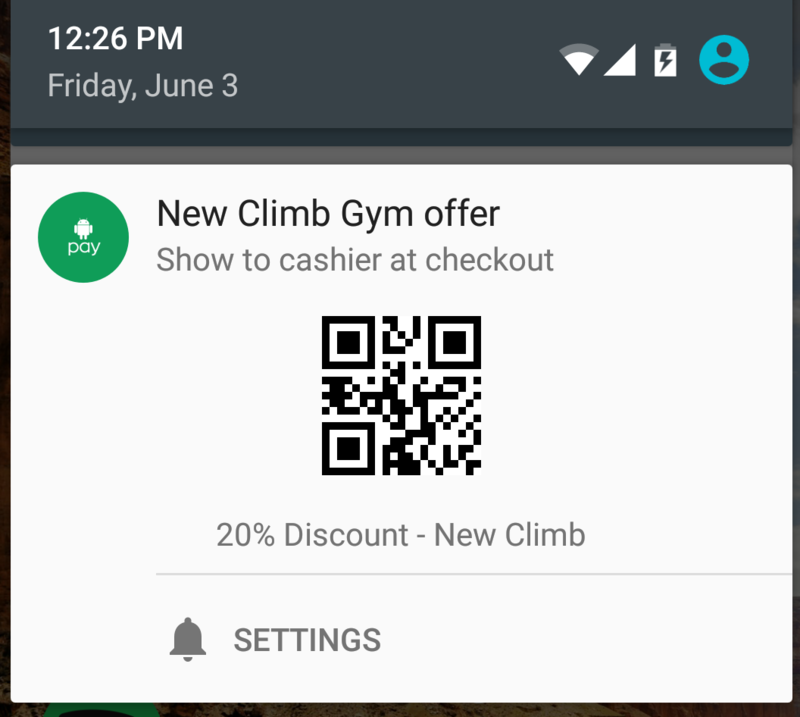 Remember: There is no support for Push Notifications at the Android Pay. 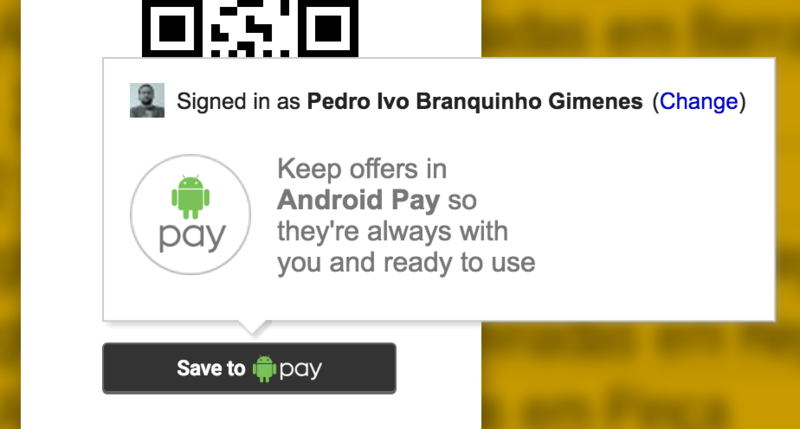 At this very moment, our service will start to synchronize the pass information with the Android Pay Servers. 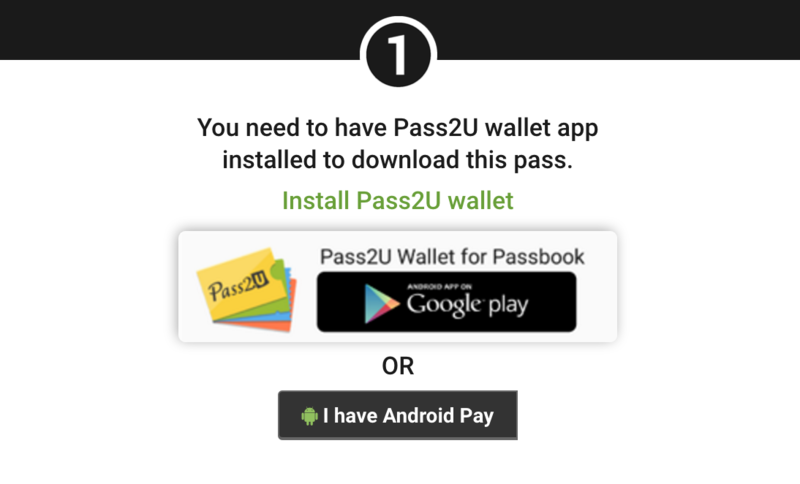 The synchronization may take some moments to be done, at this time you wont be able to install the passes on the Android Pay. 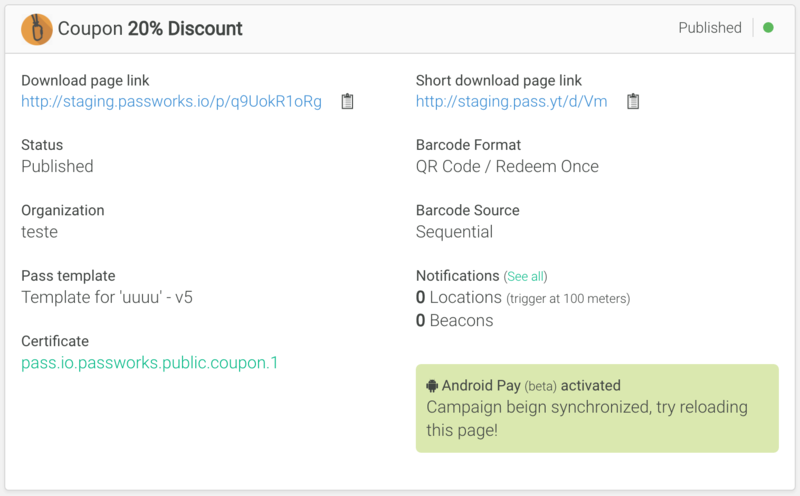 It’s done, now you can share your distribution link or passes and the users can install it to theirs Android Pay App. If any kind of error happen, a link for trying another sync should appear. Our tech team will probably be notified in advance. Remember: The download pages for Distribution and Pass are the same. The only difference is that at the Distribution page, when a user clicks for download the Apple Wallet pass, it creates a new pass and then push it to the user. Right after you publish the campaign update, we will notify the Android Pay services with the updates and it will automatically be updated on the user’s devices.